Reset the maintenance minder information display if you have performed the maintenance service. Turn the ignition switch to ON and have the vehicle at a complete stop. Display the Maintenance Minder by repeatedly pressing the (TRIP) knob. Press and hold the knob for 10 seconds or more. ► The display will blink to show it is in reset mode. Rotate the knob to select the item you wish to reset. ► Reset the selected item by pushing the knob for five seconds or more. NOTICE Failure to reset the Maintenance MinderTM display after a maintenance service results in the system showing incorrect maintenance intervals, which can lead to serious mechanical problems. 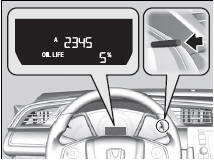 The dealer will reset the Maintenance MinderTM display after completing the required maintenance service. If someone other than a dealer performs maintenance service, reset the Maintenance MinderTM display yourself.